The Guest House Bruc I and II is the perfect place to explore the city. We are well-located, and offer private rooms with air-conditioning and heating inside. The hostel is very secure, and we have a basic kitchen for our guests’ use. 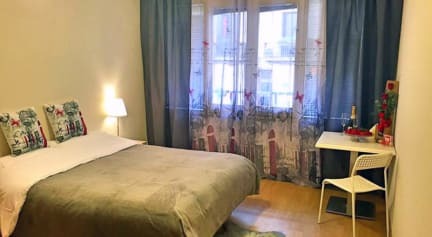 We are situated in the Eixample neighborhood, one of the best zones of Barcelona, at 5 minute walk from Passeig de Gracia, and just 10 minutes away from Plaza Catalunya and the Ramblas. The famous Barceloneta beach is just 15 minutes by metro. Our rooms have wardrobes, private bathrooms and hair dryers, and some offer a view of the outside. Cleaning service is offered every two days, and every room is equipped with air conditioning and heating. In addition, we have several common areas where te guest and travellers can get together. Please note that Barcelona Bruc Hostel I & II offers transfer from Barcelona El Prat Airport to the hostel for an extra cost of EUR 55 one way. Late check-in after 20:00 carries an extra charge of EUR 20. Please note that change of towels and bed linen carries and extra cost.